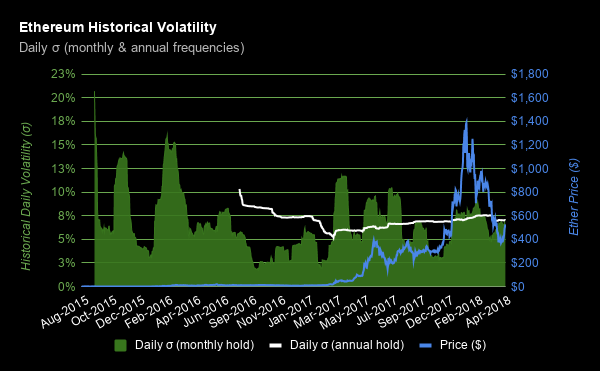 This article is my attempt to understand what “price stable” cryptocurrencies are, how they are designed and why they can (or, well, cannot) work from a technical and economic point of view. What started as a quick look into the implementations of smart contracts, quickly took me down the rabbit hole of macroeconomics, politics and crises. So, you should expect very dumbed down, introductory descriptions and explanations. For a more in-depth look of the technical aspects, refer to the implementations of projects like Bitshares, Basecoin, Maker or blog posts like the one by Haseeb Qureshi. If you are interested in more economic-savvy approaches, be sure to read the excellent series of blog posts by Preston Byrne. Any investor, trader, enthusiast or distant watcher knows this. The price of all cryptocurrencies usually fluctuates at 5% — during the boring days. During the super crazy times, prices may double or halve within hours. So, how can we get to the point where I buy my coffee with a cryptocurrency? How do we move past now, when both the barista and I know that the exact same amount of money today could possibly buy me tomorrow two cups of coffee — or not even a small water bottle? Stablecoins are cryptocurrencies that claim to provide mechanisms for price stability. What price is that? But of course the price of a single unit of the cryptocurrency in some other unit of account, most usually USD or, in cases of more extravagant and optimistic claims, in estimates like the Consumer Price Index (CPI). Now, let’s say we have a currency called STB. I am an investor that jumped on the train early on and own some STB and I want to exchange (or “sell”) my STB for USD. But why would somebody want to buy my STB? Well, the first case is that they really really want STB in order to later use them to buy some other product, for example from a company that makes the best latte in the world but oddly enough accepts only STB in payment. This is the case when STB is used as currency. The second case is that they believe that they will be able to sell that 1 STB for more than 1 USD in the future, in which case STB acts as an investment. One could argue that all assets act simultaneously as both, although it is clear that some are better as currencies, such as the USD and other fiat money, whereas others act better as investment, like real estate, gold or, in fact and so far, cryptocurrencies. So, let’s say now that I have STB but want USD instead. What price should I sell my STB for? I sit down, think really hard and decide that I want to sell them for 1 USD each. Why would you be willing to buy STB at the price of exactly 1 USD? Can I simply decide that the price of STB is 1 USD for it to be so? Of course not. So why would you be willing to do that? But of course because you cannot buy it anywhere else for less than 1 USD. If STB is a stablecoin, then you could actually buy 1 STB at the price of 1 USD today, knowing deep in your heart that tomorrow, the day after, or one week from now, you will be able to trade back that 1 STB and get 1 USD in return. In that case, the only reason you would want STB is in order to use them to buy some products, so STB would effectively act as a currency, instead of an investment. So this is the promise of stablecoins — that the price of 1 STB will remain the same (e.g. 1 USD) for the future to come. Before diving right into the various stablecoin designs, let’s first take a look under the hood of modern market economy. The sun burns hot above the African Savannah. However, our fearless warriors are up on their feet even before the sunrise — they know that they have to do their best to bring food back to their families before night falls. The forest that they live in offers two choices of prey, either hares or stags. A hare is small and, even though it can feed a family for only one night, a warrior is able to catch one on his own. A stag though is much bigger, stronger and can feed the entire village for a whole week, but it takes no less than all warriors to catch one — even if a single warrior chooses to catch a hare instead, the stag gets away. The sun has risen though, time flies and each warrior must choose either one option or the other, he can’t try both. So, what is his choice? Let’s take a look inside the mind of one of our warriors. He knows that if everybody is 100% on the same page, then it is in their best interest to hunt a stag. However, if he has even the slightest of doubts that at least on of his fellow warriors will back down, then he will also opt for hunting a hare, since bringing back at least some food is better than no food at all. For a while, things go well. Our band of warriors has worked together for many moons and they know deep in their hearts that nobody will back down from the stag hunt. Unfortunately, the night before a new hunt is about to begin, a heavy rain hits the village and one of them catches a severe cold. Before the sun rises again, the entire village mourns. What is going to happen now? How can his spot in the hunter’s group ever be filled? Fear not, his son, who is as fearless and skillful a warrior as his father, will take his place. And thus our new band of warriors embarks on a hunt. But something has changed now. Although the new member of the group promises that he will do his best, the rest of the hunters have not actually seen this in practice. The spark of doubt quickly becomes a fire and soon all warriors hunt for hares. When they come back, their families are disappointed. They liked eating stag and having them around 6 days a week. Now, the warriors have to go hunting again the next day. Days pass and our warriors, filled with doubt, keep on hunting hares. Something needs to be done. One night, the wise, democratically-elected leader of the village gathers all families together. She speaks for hours, reminding them how good life was when the warriors believed in each other, how nice the stag tastes, how easy it is to relax for the rest of the week after a stag is caught. She promises the warriors of songs about their hunts that will be sung for generations to come. The warriors slowly start trusting each other again, but days pass and there still remains the shadow of doubt. The rest of the village gets impatient and the psychological pressure on everybody is now immense. So, the leader decides to take a bold step. She uses part of the village’s wood reserves to build a big fire to cook the stag, that she says she believes the warriors will bring back the next day. It is her way of showing that she will do her best to support the morale of the warriors, even at the expense of the village’s own wood reserves. The warriors are now almost convinced — but not entirely. When they come back that night with hares again, the leader decides to keep building a fire every day, whilst using the rest of the wood reserves to build armours for the warriors that could withstand any attack by the stag. Fortunately, this erases the last shadow of doubt and the warriors come back victorious the next day. The above scenario (with minor changes) is known as the Stag hunt, described eloquently by Jean-Jacques Rousseau in the 18th century. Speaking in terms of game theory, the stag hunt has two stable solutions (“Nash equilibria”) — either all warriors choose to catch the stag or all choose to hunt hares. But how can we use that game today? Let’s apply the above to an economy. Now, the warriors are of course the enterprises and service providers, the leader is the democratically-elected government of the country and the food and wood are the assets in the economy, like the financial products (e.g. currencies, bonds etc), goods, services etc. What the above story tries to show is that economies depend highly on the belief of people that all will go well. When many people stop believing that, for one reason or another, recession comes and the economy stagnates. In most cases it such recession acts even as a self-fulfilling prophecy, making even more people stop believing and thus deepening the crisis. Can the economy regain its power on its own or, in other words, can the markets correct themselves if left alone? Some schools of thought say that yes, this is possible. But the problem is that this process may simply take too long and, as a famous economist once said, “In the long run we are all dead”. Therefore it boils down to the government to quickly boost the economy when a crisis comes, creating jobs and demand by paying from its own reserves or creating a deficit. Otherwise, people get impatient, angry, depressed, or might even, in the worst cases, glimpse towards their most evil instincts, as the Great Depression and the Great Recession have taught us. So, what does all that have to do with cryptocurrencies? As we will see in the next posts, understanding how economy works is a fundamental necessity for arguing about the viability of any financial instrument, such as, in our case, a cryptocurrency. Fiat collateralized coins are, more or less, the obvious approach to implementing a stablecoin. The primary example of such coin is Tether (USDT), with Binance Coin (BNB), TrueUSD (TUSD) and others following quickly after. Let’s call our stablecoin STBF. The promise of price stability is achieved by STBF because, for every unit of STBF in circulation, there exists a USD in collateral, stored securely in a bank account. These collaterals are available at any moment, when somebody wants to sell back their STBF. This means that if I have 1 STBF and want to sell it for USD, I can do so at a minimum price of 1 USD, by simply going to the STBF issuer and giving the STBF in exchange of its collateral USD. On the other hand, if you want to buy some STBF, then you can do so by giving your USD to the issuer and getting an equal amount of STBF. So, the maximum price at which you can buy STBF is also 1 USD. Since the spread between the minimum price that a seller is willing to sell for and the maximum price that a buyer is willing to buy for is the same, the price of STBF will always be exactly equal to 1 USD. 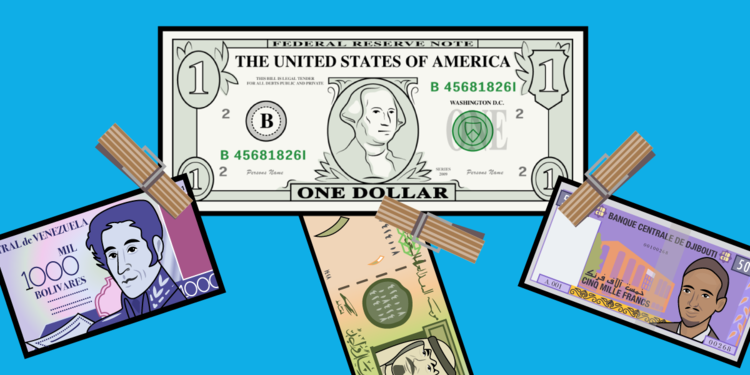 Many countries even today maintain a peg to the USD, such as Saudi Arabia or Panama. The question that everybody should always ask from the get-go. Why would somebody go into the trouble? How is such a currency useful and who is it going to benefit? Does a regular user want it to buy products from e-shops and services that accept such currencies? Such user would need to have some USD, exchange them for STBF and then use STBF for his transactions. Why would he choose to use STBF instead of USD directly, though? Well, one case is because a shop accepts STBF but not USD, a rather unlikely scenario at the moment. Another case is because he trusts and believes in the STBF ecosystem more than the USD ecosystem. What does the STBF ecosystem has that USD does not? Well, there is the fact that all transactions are public, assuming STBF uses a public blockchain as a transaction ledger. Apart from that, STBF introduces all the challenges described above, whilst relying on the economic stability of USD as well. So all-in-all not a great candidate. What about a businessman that runs an e-shop? This user wants to jump in the cryptocurrency space, but can accept only currencies that are relatively price stable. Big fluctuations in the prices of her products would practically kill the business, since (very) few people would buy a product today knowing that tomorrow its price may be halved — or doubled. Would this businessman use only STBF and not USD? I don’t see a reason why. Similarly to the regular user, STBF introduces risks that are simply not justified by the extra features. Maybe then a user that wishes to avoid the regulation and taxation that comes with USD. This is an interesting case, since it applies on both of the above user cases. Such user would want to hold an asset that is as stable as possible, but on the margins of law, so as to avoid the taxes that come with owning fiat or other regulated assets. Although this is a viable usecase for such system, one should not expect this to be the case for long. After all, sooner or later, the law catches up. Finally, let’s think of an enterprise that acts on an unregulated market. This is actually the case of such stablecoins today with exchanges. Such enterprise wants to avoid the restrictions and regulation that come with trading USD directly, so it both issues and accepts its own currency, which it claims is backed by USD collaterals. All transactions are then completed using this currency instead of USD. However, if such a business were to actually act as transparent and be as available to redeem STBF as needed, those benefits would simply not exist anymore. So, let’s ask a final, rhetorical question before moving on. Is such scheme really a cryptocurrency? The challenges of USD-collateralized assets are pretty much well-known. The basic problem is their centralized nature. When the issuer receives 1 USD in order to issue 1 STBF, they should acquire that USD via the banking processes that we have come to know and love. So, the issuer can get the USD either in cash, meeting face to face with the client that buys the STBF, or with a bank transfer, having completed the verification processes and opened a bank account. In both cases, the issuer must be either a person or a legal entity, e.g. a company or organization, which makes them by definition a central authority. What problems does that introduce? First, the issuer is subject to regulation. They must comply with the laws and guidelines of the country that they reside in and the bank that they use, since failure to do so would possibly result in seizure of the USD reserves and collapse of the whole STBF system. Second, the issuer must be available 24/7/365 for issuing and redeeming STBF. This limits their choice of the country they operate in, having to avoid cases of countries that impose capital controls or where the banking system is extra restrictive. Why is that a problem, one might say? If I want to sell STBF and you want some, we can always make the trade ourselves and you can go at a later time to the issuer in order to redeem that STBF, right? Well, if I want to sell these STBF really, really badly and I cannot find the issuer, then you have a good incentive to drop the price of STBF, since you are actually my last resort and I will have to accept selling the STBF for less than 1 USD. Third, and most important, the issuer is prone to corruption. Any organization or person that find themselves custodians of millions, or even billions, of USD, might be tempted to invest them in risky products or, even worse, take the money and run. In order to avoid getting to that point, there must be complete transparency on the state of the collateral reserves, a process that the issuer may be unwilling, or even opposed, to accept, especially in an unregulated market like the cryptocurrency market. If there is no complete transparency, even with occasional audits from trustworthy entities, the price of STBF will always be below 1 USD, since there will be some risk of the issuer defaulting. The lower the transparency, the higher the uncertainty about the issuer’s solvency, the higher the risk, and thus the lower the price of STBF. As long as the requirements for full transparency and availability are met, then such currency is sustainable. But who would do that and why? As we saw above, the only case of such coin being useful is for enterprises that actually act the opposite way. In such shady and dubious cases though, sooner or later either trust in the solvency of the issuer disappears and the system collapses, or the issuer goes full clean and has no incentive to keep it running anymore. The idea of over-collateralized assets became first widely known from Bitshares. Later, a similar scheme was proposed by Maker. Let’s call this coin STBO. 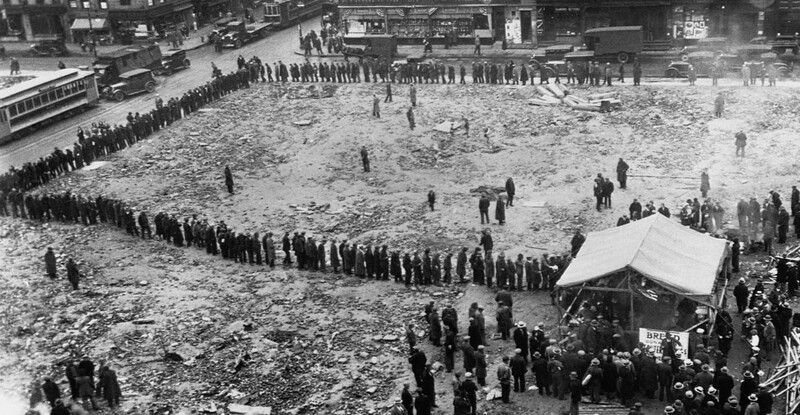 Here, there is no fiat collateral. Instead, there are collaterals in some other asset, for example a cryptocurrency like Ethereum. You could probably describe this as the system using ETH as a kind of buffer between STBO and USD. However, ETH has its own life and price in USD, which is not static. How can the price of STBO remain stable in USD, if there are no USD to back it up? Let’s see an example. A long time ago, in a galaxy far far away, the price of 1 ETH was 1 USD. So, in order to buy 1 STBO, I would buy 1 ETH with 1 USD, give it to the STBO issuer and get 1 STBO back. 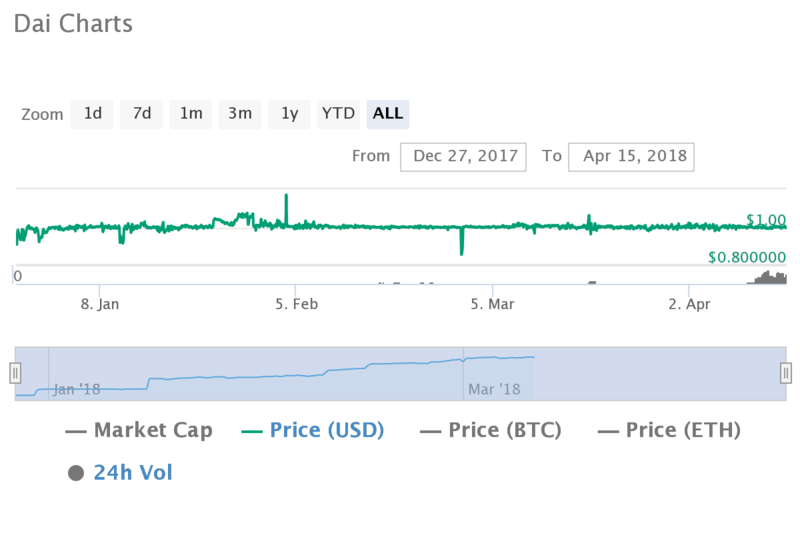 Remember that, although I now use ETH to buy STBO, the stability of the STBO price is still considered in USD. A month passes, there are some strange hacks in some Ethereum smart contracts, and now the price of ETH is down to 0.5 USD. I now want some USD, so I decide to sell my STBO for ETH and then exchange that amount of ETH for USD. How much ETH should I get back if STBO is to keep its promise? That’s easy, 2 ETH. But wait, if I originally gave 1 ETH for 1 STBO, and now I get back 2 ETH for that same 1 STBO, who provided the extra ETH? The issuer? I don’t think so. Well, you guessed it — I did. When I initially bought 1 STBO, I actually deposited 2 ETH, effectively getting back 1 STBO and locking 1 ETH as an extra collateral, that would absorb the price fluctuations of Ethereum. And what happens if the price of ETH drops even more? Then the collaterals are not enough, so STBO is automatically liquidated, returning its owner the 2 ETH — whether he likes it or not. Why would I want to do that though, why would I get into a system that makes me lock extra ETH like that? Let’s roll back the clock. As before, I have bought 1 STBO and locked 2 ETH, but I now see that Ethereum is about to introduce novel scalability updates that nobody else has noticed yet. I immediately use my 1 STBO to buy 1 ETH. A month passes, Ethereum delivers their updates, its price skyrockets to 2 USD, so I decide to get out of the STBO ecosystem. Remember, I only have 1 ETH at hand. So, I sell 0.5 of my ETH, buy that 1 STBO back, give it to the STBO issuer and get my 2 ETH in return, resulting in a total of 2.5 ETH. Hurray, I just made 0.5 ETH. Again with the pressing questions. Who would issue such cryptocurrency, why and who would want to use it? Compared to fiat-collateralized stablecoins, we have now managed to achieve some level of decentralization. Specifically, the issuance of the coins is decentralized, as well as the parameters of the system, even though the price oracle is still centralized, as we will see next. Is that enough for a regular user to use it? Remember, she has to buy ETH and lock a larger amount than what she gets (double in the example above). Even more so, she has to accept the risk that, if the price of ETH drops a lot, her STBO may be liquidated and she will be left with only ETH at hand. Would a business accept it instead of USD? Considering the risk associated with it, probably not, even with the (partially) decentralized features. 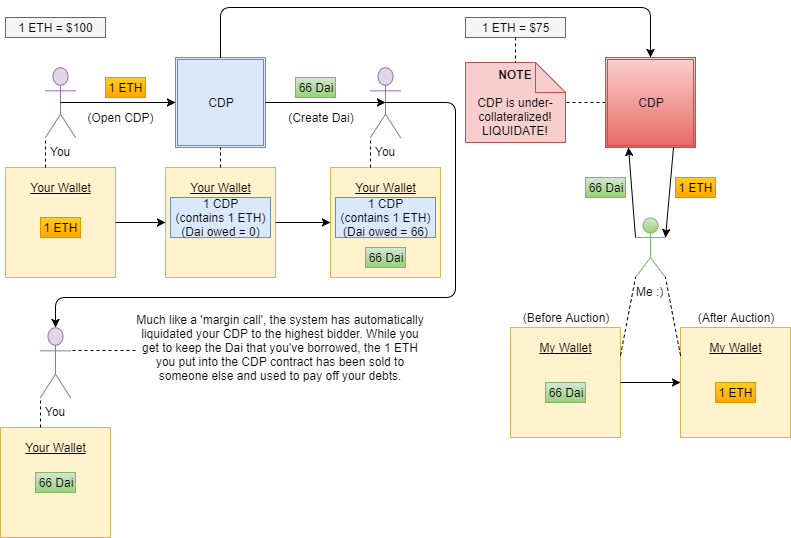 Would somebody use it as leverage though, to buy even more ETH, like described above? Sure, but as we see next, this is not sustainable in the long term. The interesting aspect of this type of stablecoins is that the issuer does not (necessarily) need to be a central authority. Instead, it can simply be a smart contract running on the network of the cryptocurrency that secures it — in the example above, Ethereum. That way, we avoid all of the problems that stem from centralization. Even in a case of a smart contract though, can the system be fully decentralized? A core parameter is the ability of the smart contract to know the price of ETH in USD at each moment. This is achieved by asking a so-called “oracle”. This oracle is usually either an exchange or a service that calculates the aggregated price of ETH from various exchanges, which of course means that it is centralized. Given that the whole system is dependent on this oracle though, the centralization problems come back with a vengeance. Could the oracle be decentralized? At the moment, I can’t see how. Given that the price is considered in USD and USD cannot exist in a decentralized setting, there must always exist a bridge between the worlds of STBO and USD. Whether this bridge consists of a single entity or multiple organizations that spread across the world is another question, but a level of centralization will always be present. Metrics like CPI are even worse in that aspect, since they are even more dependent of decisions such as which items to include in the index and how to access their market prices. The fate of STBO is also inherently interlocked with that of ETH. If Ethereum collapses, so does STBO. In the example above, we assume that the price of ETH will not drop below 50%. If it did, then our 1 extra ETH of collateral would obviously not be enough to cover for that price drop. So, we must assume that the price of ETH itself will remain within a margin. The bigger the margin, the more stable STBO will be, but also the more ETH need to be locked as collaterals. Is a 50% margin enough? 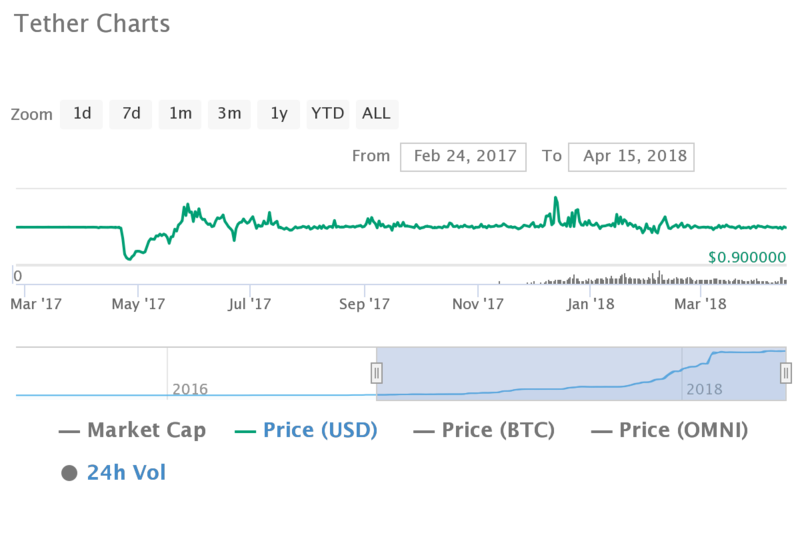 A quick look at the price chart of Ethereum, or in fact any cryptocurrency, quickly answers that question. And what would happen in the above example, if the price of ETH plummets? Well, the 1 STBO that I had bought would be liquidated the moment that the price of ETH drops by 50%. So, in the scenario when I reinvested it, I keep the 1 ETH and the investor that bought the STBO gets the 2 ETH of collateral. In other words, at that moment, I lose 1 ETH, the investor breaks even, and STBO ceases to exist. So much for stability. We can always create an STBO with an adaptive margin though, right? Sure, after all the margin is a parameter of the STBO smart contract. All we have to do is decide when that parameter changes; and who chooses the new value of it; and how fast can these updates be applied; and how flexible the system is when the rainy days come. Again, a quick look at the history of governance in cryptocurrencies probably answers the question that is on your mind right now. What if we let every user choose the margin they want? Well, in that case each STBO takes a life of its own, since each is collateralized by a different amount of ETH. Now the buyer of an STBO will look at how much collateral the STBO has and possibly reject it, if it has too little and is too risky. In the end, we will have effectively created a single market for each margin value, which is equivalent to creating multiple STBOs with different margin values, even though they would all be handled by the same smart contract. As we saw, the main reason that somebody would use STBO is as leverage, in order to buy even more ETH. And somebody would want to buy more ETH if she believes that the price of ETH will rise in the future, without dropping under the margin in the meantime. Can this work for long? Let’s see again how the system works. I have 1 USD, buy 2 ETH, use them to buy 1 STBO and then sell that for 1 ETH. So, as long as there is a belief that the price of ETH will rise, more people follow my lead, more STBOs are issued, and all is good in the world. Could the price of STBO fall below 1 USD, because there are not enough buyers for all of us? Yes, that is the first bad scenario, which is entirely plausible and breaks the price stability. But, as we will see by the end of this article, there are even more sinister forces at work. A new day comes when I have 1 STBO and the price of ETH is 2 USD. For some reason though, I now believe that the price of ETH is about to drop hard, so I decide to sell my STBO for USD. Notice that I don’t want to redeem it, because in that case I would get back ETH, not USD, and I believe that ETH is about to crash. What happens if many people share my belief? We all try to get rid of STBOs and get USD as quickly as possible, minimizing the loss. So, STBO starts trading at a price less than 1 USD, breaking the peg. Without the peg, things get worse as more people start to believe that something is wrong, so they also try to sell their STBO and thus the system goes up in flames. But wait, if the price of ETH doesn’t actually crash, wouldn’t there be people that buy STBO, as they start believing that the slump will pass? Yes, but in the meantime panic has sent the STBO price below 1 USD at best, making “price stability” a distant dream, or to plain 0 at worst. Wouldn’t the market absorb the panic though? It could, as long as it never gets widespread, or there is an investor with very deep pockets that wants STBO to succeed really, really bad and buys our positions, trying to absorb the market panic himself. History, cruel as it is though, has shown that again and again there come days when panic overcomes even the most fearless. It can start by something as simple as a sudden drop of, say, 10% on the price of the underlying asset (ETH) and soon it spreads like wildfire. A system that does not have a guardian angel with deep enough pockets would then simply evaporate. On the other hand, a system with such a guardian angel cannot maintain its “open” and “decentralized” facade for long either. We jump to a different day now, when the price of ETH is again 2 USD. However, autumn has come or, to use its true name, pumpkin spice latte season. Happy with my earnings, I decide to cash out by selling my 1 ETH for 2 STBO, in order to buy that latte that we have come to know and love (yes, this is a world where the latte costs 2 USD and I skip leg day, don’t judge). It seems though that many people share my taste. No problem, there is always somebody willing to sell right? Well, it seems I forgot that we live in a market where manipulation is allowed, if not endorsed. What a heartless, cunning manipulator has done is buy a very large quantity of STBO when I, and others like me, were selling them off for 1 USD. Now that we want them back, he decides to keep them as “ransom”. You probably guess the result. Craving for that latte, I agree to buy the STBO back for a little more than 1 USD, let’s say 1.05 USD, which is actually good enough since I still make 0.95 USD on my initial investment. And thus, subtly, the peg has once again been broken, making me pay a “fee” of 5% for exiting the whole scheme. Could this have been avoided because the market is large enough and no whale can play such games? I will leave this as an exercise. So, all in all, a system like that is expected to trade around 1 USD, during the good days, or simply evaporate on its first bad day. 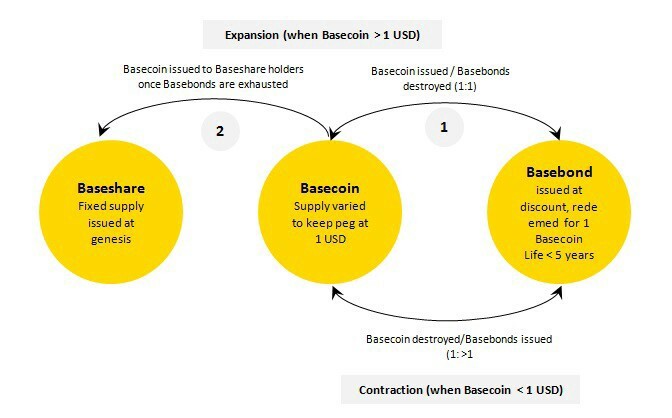 The primary example of this design is Basecoin, which has not launched yet though. Let’s now call this coin STBB. In this case, there is no collateral whatsoever, neither fiat nor cryptocurrency. The system tries to maintain the price stability by issuing a series of bonds and shares, based on the movements of the price of STBB. Specifically, the system is controlled by a smart contract, that issues STBB in exchange for the underlying asset that it runs on, for example Ethereum. So, what happens if I want to buy 1 STBB and the price of ETH is 1 USD? I now buy 1 ETH, deposit it to the smart contract and the smart contract gives me 1 STBB. So far, so good. What happens when the price of STBB changes? The smart contract should somehow counter that change, so that the price of STBB in USD remains stable. The counteraction that the smart contract takes is the change in the supply of STBB. Specifically, suppose that the price of 1 STBB rises momentarily to 1.1 USD. The smart contract is notified by the price oracle for that change and, for each STBB in circulation, it creates 0.1 STBB. The expected reaction is that users, who now have 1.1 STBB for each STBB they previously owned, will opt to sell that extra 0.1 STBB. The increased supply of STBB on the exchange markets will then result to the price of STBB falling. The process of issuing new STBB continues, until the price of 1 STBB is equal to 1 USD again. What happens when the price of STBB falls under 1 USD, say 0.9 USD? Well, the smart contract will try to reduce the supply of STBB on the market. Of course, it cannot start burning STBB arbitrarily. Rather it issues a new asset, B-STBB, a cryptocurrency which is described as a “bond”. B-STBB is then sold for STBB. In other words, if the price of STBB is 0.9 USD and I hold 1 STBB, I can buy with it 1 B-STBB. The promise of B-STBB is that, when the price of STBB goes to 1 USD again, the B-STBB can be given back in exchange for 1 STBB, so I will have profited 0.1 USD. At the same time, the fact that I gave my STBB to buy the bond results in a reduction of supply of STBB in the markets, so its price rises. Again, the smart contract continues to issue bonds as long as the price remains below 1 USD. If the system is fully decentralized and could remain sustainable over a long period of time, then possibly yes, it could be used both by regular users and businesses for daily transactions. But that if is so huge, that the odds are not in its favour. An obvious technical problem with such systems is again the price oracle. As described in the previous article, the oracle is a centralized entity that introduces both uncertainty and a point of manipulation in the system. Another problem is the dependency on the underlying platform. Although in this case the price of the underlying asset does not immediately affect the price of STBB, the health of the ecosystem and the security of the platform do. So scalability issues, hacks or attacks against the underlying platform are bound to affect both the usage and the price of STBB. The fundamental problems though come when we take a deeper look in the economic sustainability of such system. Let me reply with a question. Can people remain confident that this system could work well? If you believe that the answer is “Yes”, then you have answered the above question. But, as we have seen so far, this is not a question that can be answered so easily and, unfortunately, the answer in many cases is plain “No”. Let’s look into the system one more time. When the price of STBB falls under 1 USD, in other words when people try to get rid of STBB quicker than other people try to buy it, the system tries to restrict the supply of those STBB by issuing B-STBB bonds. Why would people try to sell in the first place? Either because they believe that the price and/or the whole system will fall or because they need USD to buy something that cannot be bought by STBB. So, where does demand come from? Who is going to buy those bonds? Well, somebody who believes that, even though at the moment the system is in a slump, this will quickly pass and the price will again rise to its proper levels. Can this person be the same as the one that tries to sell STBB? Probably not. If that person believed that the price would go up, he would not try to sell STBB in the first place. If that person needed to buy a product from an enterprise that does not accept STBB, how possible is it that the same enterprise would accept B-STBB instead? So, the person that buys bonds is a person that would believe in the system, either buying STBB or B-STBB. But then why would he buy B-STBB and not STBB directly? After all, both STBB and B-STBB would give him back 1 USD, when the price of STBB goes to 1 USD. Maybe B-STBB pays interest, e.g. at a 10% interest it is redeemable for 1.1 USD, instead of 1 USD, in which case, well, where does that extra money come from? Maybe he has both the economic ability and a personal incentive to see the system succeed, in which case we talk about a guardian angel again, like the one in the previous article. Maybe he simply believes in the system so much, that he thinks buying the B-STBB contributes to both the system’s recovery and, consequently, him profiting. Charming thought, but does it work in the long run? Going back to the stag hunt at the beginning of this series, if days (let alone months) go by and recovery does not come, more and more people will start getting impatient and frustrated. B-STBB has lost its price stability a long, long time ago, but now it starts losing its appeal of recovery too, so more people will try to get out of the system and, sooner rather than later, both STBB and B-STBB go bust. Can’t the market itself absorb such turmoil? For short periods of time, for contained events or as long as a guardian angel can buy STBB and/or B-STBB, yes. But could such system really last long? What happens when speculators jump in and start shorting it? I leave again these questions as exercises. Instead of conclusion, a thought: if we expect computer scientists to start designing financial markets, perhaps stories like the Black Wednesday should also start replacing the spooky tales of hacks and cracks that first-year CS students tell each other.